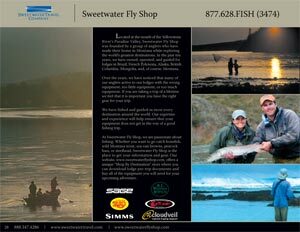 The Sweetwater Travel Company, founded by the Vermillion brothers over 15 years ago in Livingston, Montana, guides fly fishing lovers in pursuit of the best fishing on the planet. 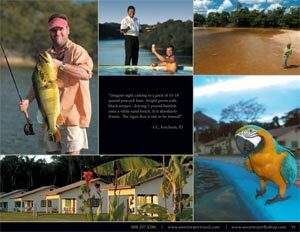 When you think of a Sweetwater Travel destination, think exotic. Think remote. Think breathtaking. Think Brazil, Alaska, British Columbia, the Bahamas, Montana, Mongolia, New Zealand. And think big fish. 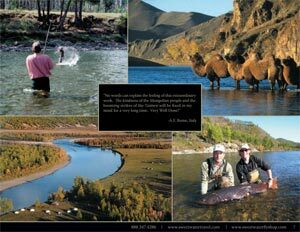 Target - The exotic fly-fishing-trip-business was created for upscale clientele who expect exclusivity, striking locations, the highest level of personal service, and bragging rights for catching huge fish. Everything about this piece needs to speak to this audience. What you'll notice throughout this catalog is the absence of pricing. Sweetwater is selling top quality and exclusivity; in fact they're really selling dreams. And why let something like pricing get in the way of your dreams anyway? 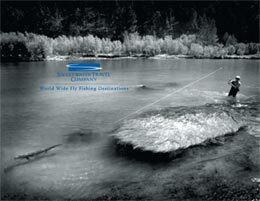 Awesome fly fishing catalog with effective design elements that effectively markets the business. Appeal - A catalog like this must be top quality through-and-through. To elicit the right emotional appeal, the photos should leave the reader thinking, "That's where I want to be right now." The photography in this catalog is superb: professional, high quality, high resolution, with an excellent use of light and color, not to mention some great photos of really big, beautiful fish. Photo Format - The large format of the images help make them the central theme to the whole piece. And the images crispness and clarity due to some skillful photography leave the viewer with lasting impression without flaws or imperfections to detract from the viewing experience. Using the right camera - the right way - First rule - be there and have a camera. Second rule, use a tripod whenever possible. Your photos will come out crisper and clearer. If you don't have a tripod, your camera may have internal image stabilization capabilities, but there really is no replacement for using a tripod. To take high quality photos that can be printed at almost any resolution, make sure your camera can save images in a "camera raw" format, (sometimes known as digital negatives). Credibility Factors. No doubt people judge quality by touch. They often use firmness and thickness to determine the quality of a catalog, and by association, the quality of the company. To give this catalog a feel of excellence and superiority, an 80# cover weight paper was used for the cover, and 100# text paper was used on the inside pages. 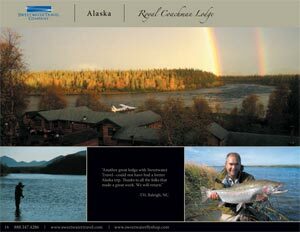 A brief background summary of the owner's experience, along with logos from well known fly fishing equipment and apparel manufacturers lend additional credibility to the message. Catalogs are an excellent medium to share inspiring pictures united with the right text. This combination allows you to create emotion with images, and then drive home the message with content; but the text needs to be presented in the right way. The text in this catalog was skillfully added to enhance the images and add to the emotion that they created. Great photos and design elements for high quality catalog printing. Attention Directors - What printing and design techniques were used to draw the reader into the experience and help create the dream? Hue and saturation use. A hue refers to a color's place in the visible spectrum, or its "true color," whereas saturation refers to the color's clarity and purity. For example, a color with low saturation will have a more gray appearance, while a highly saturated color will appear more brilliant and pure. The right color saturation can bring vibrancy and a more three dimensional quality to images when expertly done. However, too much saturation and alteration of the hue could make photos look phony which might repulse rather than attract. The designer of this catalog used the right levels of saturation to draw attention to objects in the photos while maintaining a realistic and appealing look. Incidentally, this was printed entirely with CMYK colors - no Pantone colors were needed. Motivators - While the photos and content create the right emotional appeal for the audience, what action does the catalog encourage them to take? Header and footer. The consistent use of a header and footer in this catalog on each page trains the reader where to find the destination package and contact information. It's a clean way to help prospective customers take the next step and contact the company without any clutter that could draw attention away from the images. And the information is hard to miss, offering the reader the opportunity to call or email in an understated but obvious way. Conclusion - High quality printing appeal! The skill and effort that went into making this superb catalog gives any reader added confidence that the travel experience will be no less remarkable. This is so well done, it makes me want to say, "I'm packin' my bags." Need help with a custom catalog design?